On Wednesday morning, a rocket blasted off from Blue Origin’s West Texas facility in West Texas, carrying eight NASA experiments into space with it. 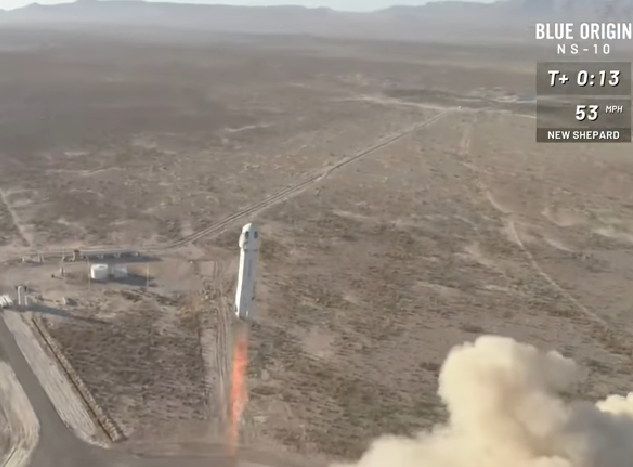 Climbing past an altitude of 350,000 feet (over 100 kilometers), the New Shepard rocket launched its capsule, from which the company founded by Amazon CEO Jeff Bezos plans to conduct space tourism. Blue Origin tweeted that it plans to begin flying humans to space next year. Those watching Wednesday’s launch probably assume that the parts for American rockets are made in the United States. While that may be true for space-travel companies like Space X, Blue Origin and Virgin, it isn’t for rockets sent skyward for national security missions, through something called the United Launch Alliance. These rockets are powered by Russian engines. Yes, you read that right. Our Cold War enemy for 30-odd years, which ironically started the space race with the 1957 launch of Sputnik, all use RD-180 engines made by NPO Energomash, a Russian state-owned company. Meanwhile, magnets made from Chinese rare earths are used in the Joint Strike Fighter, the Pentagon’s answer to a one-size-fits-all warplane. If Cold War Presidents from Harry Truman to Ronald Reagan knew that the nation’s national defense rested on technologies coming from its former and current adversaries, they would surely be turning in their graves. But it is apparently so. The United Launch Alliance is a joint venture between Boeing, Lockheed Martin, the US Air Force, NASA and the National Reconnaisance Office (NRO). Defense One reports that US reliance on Russian rocket technology will remain until at least 2020, due to a contract with ULA. The ULA is a symbol of US dependence on Russian suppliers for a critical element of national security – the ability to launch rockets. As Defense One argues, if Russia decided to withhold delivery of the RD-180, the Air Force, NASA and the NRO would be unable to deliver critical launch operations, leaving America vulnerable to Russia and other adversaries. An increasingly aggressive Russia and China makes this vulnerability all the more disturbing. Unfortunately, the United States Military and dozens of high-tech North American companies are as dependent on China for their rare earth elements as the United Launch Alliance is on Russian-made rockets. How did this happen? In this article we create a timeline and offer a patch to this ever-widening hole in national defense capabilities. The $392-billion F-35 Lightning II Joint Strike Fighter program was close to being canceled about seven years ago but for intervention by the Pentagon to prevent further delays. Reuters reported in 2014 that the chief US arms buyer allowed two F-35 suppliers, Northrop Grumman Corp and Honeywell, to use Chinese magnets for the plane’s radar system, landing gears and other hardware. In doing so, the Pentagon was actually waiving laws banning Chinese-built components on US weapons. Permanent magnets employ the rare earths neodymium, praseodymium and dysprosium. If that doesn’t stick in your throat, how about the fact that the program was hacked and copied by the People’s Liberation Army, which “recently rolled out some suspiciously sophisticated stealth fighter prototypes of its own,” according to a 2013 article in Breaking Defense. The Trump Administration last year recognized the importance of rare earths elements – albeit as an after-thought – when it pulled them off a list of Chinese imports to be hit with US tariffs. China mines about 80% of the 17 elements that appear on the Periodic Table, and has a lock on about 90% of rare earth processing. It’s a little known fact that the United States was once the largest producer of rare earths in the world, at the Mountain Pass Mine in California. Little happened at Mountain Pass during the 1950s except for the odd bit of research by the defense and scientific communities, but that all changed in the 1960s with the color TV. The discovery of europium, which emits a brilliant red light when bombarded with electrons, ushered in the age of technicolor, and Mountain Pass, which had abundant europium, flourished. Rare earths mined there were also used in medical scanners, lasers, fluorescent lights and microchips. In 1980, a mis-classification of rare earths had catastrophic consequences for US rare earth mining. The Nuclear Regulatory Commission and the International Regulatory Agency placed rare earth mining under the same regulations as mining thorium – a radioactive element that drops out when processing heavy rare earth minerals like monazite. As we have written, the nuclear industry and its future would look a whole lot different if thorium rather than uranium was pursued as the main nuclear fuel. But that’s a different story. New, onerous regulations on thorium made the mining and refining of thorium-bearing rare earth elements risky. Over the next two decades, the US rare earth mining industry collapsed. Defense One notes that, even though American mining companies extract enough rare earth ore, through mining other metals, to meet 85% of global demand, it is discarded because the regulations make it uneconomic to mine. How’s that for irony. The Chinese filled the void left by US rare earth mining with gusto – establishing the world’s largest rare earth research facility; filing the first rare earth patent in 1983 and over the next 14 years filing more patents than the US which had been working on them since 1950; and acquiring US technology in metals, alloys, magnets and rare earth components. Then in the 1990s, the Mountain Pass Mine ran into trouble. Owner Molycorp faced legal action in 1997 after it was discovered that repeated spills from its wastewater pipes had contaminated the Mojave National Preserve with trace amounts of radioactive thorium, barium and uranium. 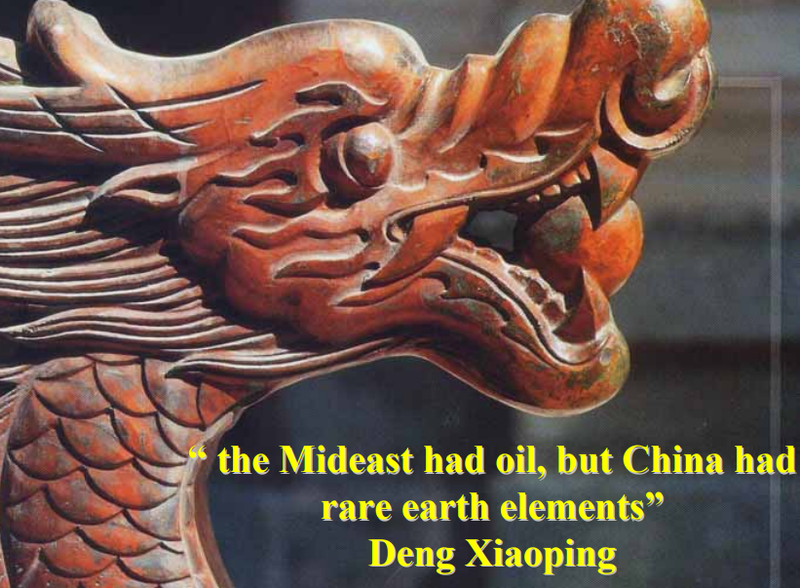 It was around this time that China started a program to develop its own rare earths. The Chinese began mining the massive Bayan Obo mines north of Baotou, Inner Mongolia – containing an estimated 70% of the world’s rare earths reserves. A flood of Chinese rare earth oxides into the market hurt Molycorp, which shut down its processing facility in 1998. Processing plants in the US owned by German and Japanese firms moved their operations to China. There are none left. China wouldn’t have been able to develop its REE industry if it wasn’t for the dubious acquisition of Magnequench, a division of General Motors established in 1986. In 1982, General Motors research scientist John Croat created the world’s strongest permanent magnet using rare earths. The purpose of Magnequench was to produce neodymium-iron-boron (NdFeB) magnets, a superior type of permanent magnet that GM needed for its vehicles. In 1988 Indianapolis-based Magnequench was mysteriously sold to members of former Chinese leader Deng Xiaoping’s family. The facility was then shut down and moved to China in 2000. For the fascinating story of how Magnequench and its technology was ceded to the Chinese, read a 2006 article by Jeffrey St. Clair. (The connection with the Deng Xiaoping family was through the Sextant Group, which purchased Magnequench from GM. Sextant was a front for two Chinese companies with close ties to the government, which it is believed targeted Magnequench for developing its long-range cruise missiles). Since then, rare earth metals, alloys and magnets needed by US defense contractors come either directly or indirectly from China. According to the US Geological Survey, the United States relies on Chinese imports for at least 20 minerals, including rare earths. 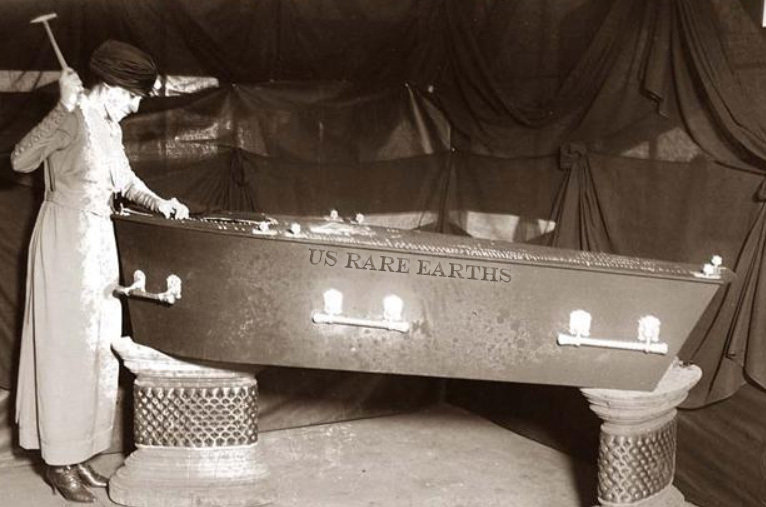 The final nail in the coffin for US rare earths came in 1998 when the US National Defense Stockpile sold the entire strategic reserve of rare earths. The same year, the last US producer of rare earth metals and alloys, Rhodia Incorporated, closed its processing facility in Texas and built a new one in Mongolia. In 2009 the Chinese government imposed export controls on its rare earths, meaning a 40% drop in exports. Beijing said it had to implement quotas to protect the environment, but critics saw them as naked protectionism. China was about to play Molycorp like an erhu, a Chinese violin. A year later, an international incident sent rare earth oxide prices into the stratosphere. In September 2010 a Japanese naval vessel interdicted a Chinese fishing boat near the Senkaku Islands, which Japan and China both claim ownership of, and detained the captain. The response hardly seems balanced in retrospect, but the Chinese decided to ban all rare earth exports to Japan, then an industrial powerhouse and China’s largest REE customer. The rare earths market panicked, and within months, all of the rare earth oxides gained in price. The result was the re-opening of the Mountain Pass Mine, including a $130 million investment by Japanese conglomerate Sumitomo to upgrade the mine. By 2014 it was producing 4,700 tons of rare earths a year. While the spike in rare earths prices was good for miners like Molycorp and the numerous exploration companies that sprang up in search for them, buyers of products made from rare earths balked and pressured governments to do something about it. The US, European Union and Japan brought a case to the World Trade Organization to try and settle the dispute and get China to lift the restrictions. In 2015 it did, resulting in a torrent of Chinese rare earth exports into the market and the inevitable collapse in prices. The move caught Molycorp off-guard. The company had just spent over a billion dollars on another upgrade at Mountain Pass but within months, the company fell deeply in debt and went bankrupt. The mine was put on care and maintenance and eventually sold at auction in the summer of 2017 for a shocking $20.5 million – a fraction of its previous worth. The new owner is MP Mine Operations LLC, an American-led consortium, with Chinese rare earths miner Leshan Shenghe Rare Earth Co. holding a minority interest. Mountain Pass currently ships rare earths concentrate for refining in China, although the owners say they plan to build processing capacity in the US in about 18 months, according to a recent Bloomberg article. What can the United States do about the Chinese monopoly on rare earths, which it has used to control prices and bankrupt the only US producer? In 2016 ThREE Consulting, the Thorium Energy Alliance and retired brigadier general John Adams suggested new legislation that would create two private entities: one to upgrade rare earth ore into metals, alloys and magnets; and another to store thorium. This would ensure a reliable rare earths supply for defense contractors and non-Chinese technology companies. As far a we know, however, nothing has been done. Spur innovation in minerals production by removing regulatory hurdles. Accelerate the mine permitting process which in the US is seven to 10 years. Dedicate more of the Defense budget to rare earths mining and refining. Create a centralized, cooperative rare earth refinery. This would ensure production of heavy rare earths (Mountain Pass currently only produces light rare earths) and the potential for thorium-based nuclear energy. Continue to fight against unfair trade practices. The other critical piece of the puzzle is to explore for rare earths in North America, thus creating a “mine to magnet” supply chain. While the United States has some rare earths deposits outside of Molycorp, in Alaska and Wyoming for example, none is anywhere close to production. At Ahead of the Herd, we have identified two very interesting companies that have strong potential for producing rare earths – one is a pure rare earths play and the other could produce rare earths as a by-product of lithium mining. Defense Metals Corp (TSX-V:DEFN) is progressing the Wicheeda Lake deposit north of Prince George, British Columbia. Rare earth-bearing minerals bastnasite and monazite are disseminated fairly uniformly throughout the property. Fourteen diamond drill holes completed in 2008 and 2009 contained potentially economic light rare earth elements cerium, neodymium, samarium and lanthanum. As mentioned neodymium is used in electric vehicle motors. Smart weapons rely on sophisticated motors and actuators to steer them towards their targets. Missile and bombs therefore incorporate REEs such as terbium, dysprosium, samarium, praseodymium and neodymium. Samarium-cobalt magnets resist corrosion and can operate at high temperatures. Dysprosium is added to neodymium-iron-boron magnets in high-heat applications. The other company is Cypress Development Corp (TSX-V:CYP). Within the past two years Cypress has moved its Clayton Valley Lithium Project from exploration to a stellar resource estimate, onto a PEA, and within the next few months is expecting to release a prefeasibility study. According to the PEA Cypress has a unique and potentially extremely lucrative opportunity to mine rare earths, and scandium, at its Clayton Valley Lithium Project, along with lithium carbonate used in electric vehicle batteries – a booming market. Neodymium, dysprosium and scandium are identified in the PEA as potential rare earth oxides. When added to aluminum scandium delivers a potent combination – lighter, stronger and more malleable, making the alloy ideal for aircraft, cars or ships that can save on fuel costs. It is also used in solid oxide fuel cells (SOFCs) and sports equipment like baseball bats and tennis rackets. Smith & Wesson has even used scandium-aluminum alloys in revolvers. According to the USGS, the market for scandium oxide is estimated at just 10 to 15 tonnes per year. No scandium is currently mined in the United States. If Cypress has the capability of producing rare earth oxides as by-products of lithium mining, it could represent a major reduction in processing costs, by earning extra revenue that would offset costs, including $100 million for a sulfuric acid processing plant. It’s incomprehensible that the United States lumbered into a position of utter dependency on China for rare earth metals – ceding its 1950s monopoly to China either through ignorance of the importance of rare earths, or allowing itself to become a victim of subterfuge when it let Magnequench go to a company with close ties to the government of Deng Xiaoping. We may never know who was asleep at the wheel, but we do know that the situation as it stands is untenable and must be corrected. 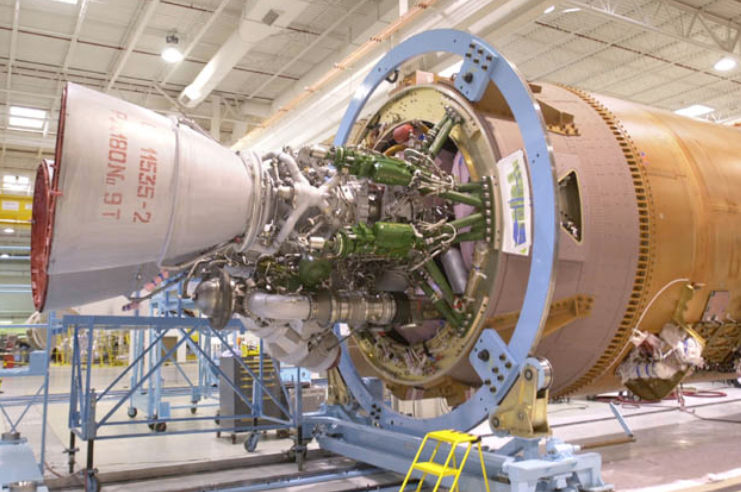 Chinese magnets in American fighters and rockets propelled by Russian-made engines? C’mon. The solution is to commit funds, remove regulatory barriers and start exploring for rare earth minerals in North America. We’re Ahead of the Herd with two companies that hold the promise of addressing the rare earths dilemma. Defense Metals (TSX.V:DEFN) is an advertiser on Richard’s site aheadoftheherd.com. Richard owns shares of DEFN. Cypress Development Corp (TSX.V:CYP) is an advertiser on Richard’s site aheadoftheherd.com. 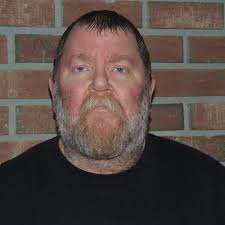 Richard owns shares of CYP.